For many working professionals, reaching their golden years often means it’s time to tap into the retirement fund and move to a cottage by the seaside. But for others, this traditional outcome of thirty years of employment simply does not work anymore. Such is the case of Sorbet CEO Ian Fuhr, who was recently interviewed by Hippo.co.za for a blog post titled “Nevertirees – Why Some Top Business People Refuse to Retire.” The article features several other entrepreneurs over 50 who are still actively involved in the labour force. 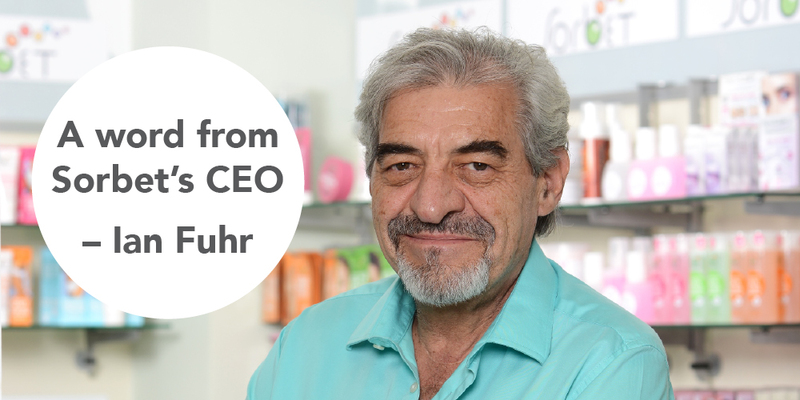 As he shares his journey to success across different business ventures over the years, Mr Fuhr also explains why he has no plans to retire just yet. In an introduction to the interview, Mr Fuhr reveals himself as a true entrepreneurial spirit. He launched several companies during his business career, including a retail chain called Super Mart, a record company and a race relations company. This was before he landed in the beauty industry with the Sorbet Group whose success has spawned 138 franchised salons. Sorbet also went international in August 2015 with the opening of a salon in London. Franchising the first Sorbet salon also happens to be Mr Fuhr toughest career challenge. In the interview, he recalls the company owning 22 stores five years after they launched before the first entrepreneur bought a franchise from them. “This was achieved through sheer perseverance in the belief that great customer service and value for money would ultimately build the credibility of the brand,” Mr Fuhr tells Hippo.co.za. You can read the full article, which include interviews with other South African entrepreneurs, on Hippo.co.za’s blog.